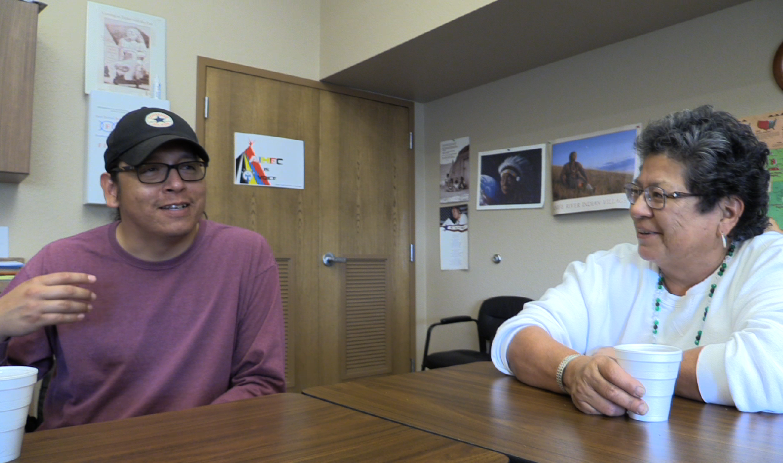 Delvin (DJ) Driver Jr. is a faculty member in the Native American Studies department at the Nueta Hidatsa Sahnish College, and past instructor at the MHA Summer Institute. 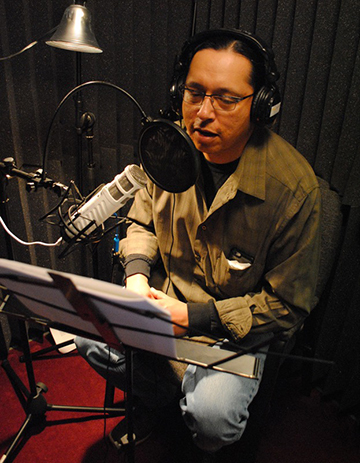 His voice can be heard on the CD version of the Level 3 Hidatsa textbook. The following remarks are from an interview conducted with DJ a few weeks before the 2017 MHA Summer Institute. I’m Hidatsa and Mandan, from Parshall on the Fort Berthold Indian Reservation. Growing up, I always heard the language in my family. I think I’m very fortunate because of that. And there comes a point when you just say to yourself, I want to know what they’re talking about. When I was really young, my dad had this tape recorder he would take to powwows and other places. One day I asked to borrow it. He gave me some blank cassettes. I asked him to record some words on it. At night, I’d put the blanket over the speaker and fall asleep listening to these words on with tape recorder. When it stopped, it would click loud enough to wake me up — it was an old tape recorder. So I would rewind it back and play it over again. So I always had the words. That was kind of my first conscious effort to try to learn the language. My generation was one of the first to not have it be their first language. But now, growing up, I know who my classmates are. When I see them at powwows– they know the language as much as I do. Maybe they were learning it just like I was. Just over 10 years ago, I worked at the agriculture department here at the college. I taught equine nutrition. My dad worked here for quite some time, teaching the language. His office was right here, and my office was just across the way. On lunch break or whenever, I would just walk over here and visit my dad. I’d come and visit here, and there was another gentlemen here. They were fluent speakers, and they would talk all the time. And I would come and say hello, and pretty soon there would be a workshop or something, where they would both go, and my dad would say, “Do you want to cover my class for me?” And I’d say, “Yeah, sure!” He’d give me his materials, his notes, whatever. And that’s how it started. So I kind of became his go-to guy. If he was going to be gone for whatever reason, I would just cover his classes. I did that for all of his classes he was teaching. So I kind of knew how he did things, I knew his curriculum, I knew his formula. And that went on for years. When he retired, our previous director said “your dad’s gonna retire, and, you know, I noticed you were covering his classes.” So she offered me the job. I’m now a teacher in the Native American Studies department. There’s not very many of us in our department — only four — but we’re close, and we work together pretty well. There’s not too many people speaking the language anymore. The language goes, the culture goes. There’s a lot at stake. It’s not just words. It’s a whole lifestyle, it’s a whole identity that goes back way before Columbus got lost and came over here. It’s who we are, and it reaches way back to our Creation stories. Farther back than people realize. That’s what we’re talking about. We talk about sacredness, and things we can talk about and can’t talk about. Things, ceremonies you need to participate in, you know, as an obligation. I have a 13 year old boy. I’m trying to get him involved with languages as much as I can. He is my main student, but it’s hard, it’s tough. It’s hard for us as parents and grandparents to compete against the Justin Biebers, the One Directions, all the MTVs, internet, YouTube. It’s hard for us to keep up with that. So that’s where our kids are. You know, everyone has a cell phone, including me, so all that technology is on there. We’re up against quick information that’s not from our culture. So that’s where the struggle lies, is how to we become their source of learning, you know. We need to trade places with the Justin Biebers.